With the recent update of Pale Moon, I found a trouble with Pale Moon. That is the problem of FoxyProxy Standard addon on Pale Moon. Actually it is a known issue of the incompatibility. Thus, I think soon I will stop using Pale Moon. Similarly, GNU IceCat (in Arch Linux) has a little difference from Firefox. It can be obviously noticed when using Google Search, there is no instant search. This is because of the user agent showing that the browser is IceCat instead of Firefox. By changing the default user agent to Firefox, then IceCat can use the Google Instant Search. However, with the recent update (in Arch Linux AUR), IceCat user agent is now Firefox. 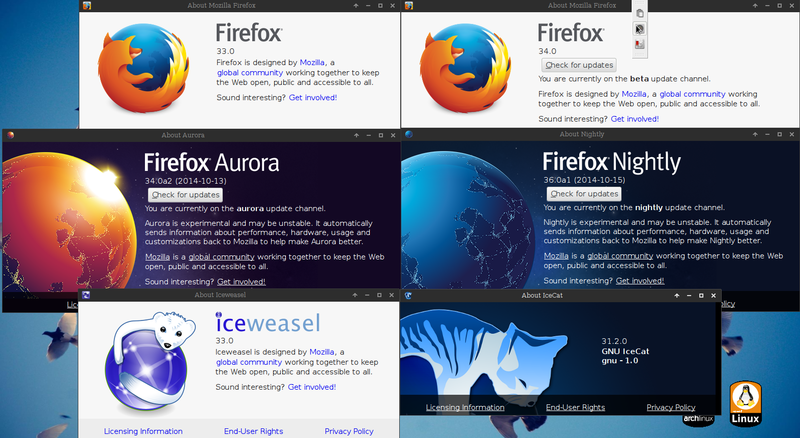 Today I tried Iceweasel (not GNU IceWeasel), it is just exactly same as Firefox. Comparing to IceCat, IceCat uses the profile folder in ~/.mozilla/icecat, yet Iceweasel uses ~/.mozilla/firefox. Thus, to run Iceweasel together with Firefox, I have to use the method recently mentioned. Now, I can run 6 different Firefox instances at the same time. Why running so many variants? My main reason is the proxy, because my problem is too complicated that using the patterns in FoxyProxy Standard cannot solve.